The match has gotten under way and the score is currently 2-0 to Real Madrid. It’s proving to be a fantastic match already and will the Italian side be able to come back from such a deficit? The two most successful clubs in Champions League face off tonight in a cracking match in Group G. Despite Madrid’s 9 titles, and Milan’s 7 – these sides feel like they have a lot to prove this season with European success a distant memory to their fan bases. If you plan to watch Real Madrid vs AC Milan live, stream online or on TV – make sure to check out our match preview below. Backed by reknown coaches in Jose Mourinho and Massimilliano Allegri and some of the top signings during the recent transfer window – both AC Milan and Real Madrid will feel like they have what it takes to advance to the late stages of the Champions League. In tonight’s match the two sides go into the game clear above their opponents Ajax and Auxerre and so this match’s significance will be more in confidence more so than anything else. Real Madrid head into the game with a bit of momentum, with a perfect record to their game ever since their opening match including last weeks’ 4-1 win over Malaga. However injuries are not in Real Madrid’s favor with Kaka, Garay, Albiil, and Gago some of the names off the available player list. For Milan Thiago Silva is the notable missing player for the Italian giants. Xavi and David Villa are doubtful for Barcelona's clash at home to leaders Valencia at the Nou Camp. Xavi has been sidelined since before the recent international break with an Achilles problem and was unable to complete training on Thursday. Villa, who injured his knee in Spain's 3-2 win over Scotland in midweek, also failed to complete the session and could miss the opportunity to face his former club for the first time. The Asturian forward scored more than 100 league goals for Valencia in six seasons at the Mestalla and was a key player for Spain in the team's World Cup success over the summer. Villa had been looking forward to facing his old club, but now faces a late fitness test ahead of the game. Barca coach Pep Guardiola must also decide whether to risk Xavi or hold back the Spain international for the Champions League match against FC Copenhagen on Wednesday. One player who will definitely miss out is Pedro, who tore his hamstring in the recent game against Real Mallorca. Barcelona dropped to fourth place in the Primera Division following a disappointing 1-1 draw in that match and the Catalans4 home form this season must be a cause for concern for Guardiola. Barca have won just once at home in the league and that was an unconvincing 1-0 success over Sporting Gijon. Guardiola4s side will need to do better against in-form Valencia. "We can't afford to lose any more points at home,'' full-back Adriano said earlier this week. Valencia are currently unbeaten, having won five and drawn one of their first six matches. And Barca captain Carles Puyol expects a difficult match against Unai Emery4s side. "It will be a difficult game against a good team,'' he said. Valencia striker Roberto Soldado, who was brought in to replace Villa in the summer, believes now is the right time to face Barca. "We are ambitious and now is the time to cause Barcelona harm,'' he said. Marius Stankevicius will hope to shake off a virus in time but Miguel misses out through injury. Driving into the office, I pass a number of billboards that seem to cover the entire human condition. "Direct Cremation" reads one. Almost directly on the other side of the road a billboard announces a deal for "Blazing Hot Stoves." As I merge onto Interstate 84, a dangerous intersection, a sign asks me, "Have you been hit by a truck?" A little ways down the road I'm told "When you die, you will meet God." There's a final call to action before I hit my exit: "Oops! You just passed Captain Liquor!" Really, is there anything more depressing than billboards? Well, yes, if you happen to live in Liverpool. The club, of course, hit another low on Sunday. With new owner John Henry in the stands at Goodison Park, the Reds fell to the Blues in a Premier League derby for the first time in four years. Any euphoria that Liverpool fans felt when Hicks and Gillette were finally sent packing quickly disappeared in a game that highlighted the team's many problems. It's a long list to consider. For starters, Fernando Torres is being starved of service from an ineffectual midfield. He might as well be on an island by himself. For Torres to be effective, he needs service from the wing players, which on Sunday were Joe Cole and Maxi Rodriguez. But Liverpool has no width. Both Cole and Rodriguez kept looking to come inside instead of bombing down the flanks. Cole, in particular, is in a major league slump. He doesn't have a left foot to speak of, and he goes missing for such long stretches that you half expect to see his face on the back of a milk carton: "Missing: English winger and attacking midfielder with a knack for creative playmaking." Liverpool has struggled with wide players for some time. See Albert Riera and Yossi Benayoun (both of whom left the club after last season). Unlike Cole, they are capable at spreading out the play, but Liverpool didn't know what to do with them, too often sending the ball up the middle through Steven Gerrard. Nothing has changed with Mr. 4-4-2 Hodgson, who fidgets from the sidelines as if he needs to be treated for OCD. It's in stark contrast to his placid demeanor last season at Fulham, where he exuded a quiet confidence. Another issue for Liverpool is Brazilian Lucas, who adds nothing but dead weight and poorly taken chances from the midfield. And even on those few occasions when he receives the ball, Torres looks off his form, too. If he didn't know it before, Henry knows it now: He's got a major overhaul on his hands. This isn't a one-season turnaround -- it's a multiyear project. The Reds can kiss goodbye any hope of Champions League football -- and the injection of cash that comes with it -- for many seasons to come, especially with the competition of strengthened teams such as Manchester City and Tottenham Hotspur. Even Everton and Aston Villa look to be poised for more success than the Reds. During Liverpool's transitional period, you can expect major changes at Anfield. How long, for example, will Torres remain stranded up top, where he cuts the grumpy, moody figure these days? January might not come fast enough for El Nino. Thirty-two year-old Jamie Carragher -- who should be commended for his work rate on Sunday -- will be done. At 30, Gerrard is not someone you build around anymore, though Liverpool might not have a choice. England international Glen Johnson, a right back who loves to attack but too often forgets his defensive obligations, might head for greener pastures. All the while, Henry's got to revamp a stadium in decay. Will the Reds be relegated? Still hard to believe that will happen, though Sunday's performance does give you reason to pause. Liverpool hasn't cornered the market on team implosions. Another English institution, Manchester United, appears to be a time bomb that could detonate sooner than later. The club is walking a financial tightrope -- last week, it announced an operating profit of £100 million pounds and posted a £83.6m loss -- while the Glazers continue to come under fire. Supporters are understandably upset that the ownership is spending millions on debt service instead of investing in new players who aren't named Bebe. Really, some people have no appreciation for the American way. Meanwhile, the players on the field find themselves in more crises than Amy Winehouse. On Saturday, the Red Devils threw away yet another lead, as Edwin van der Sar committed an epic error that landed him a 10 out of 10 on the Robert Green sliding scale of blunders. That makes a total of six points dropped in matches where United had the lead. For a team that created a slew of chances in the first half against West Brom, it struggled to muster any creativity or attack in the second half. 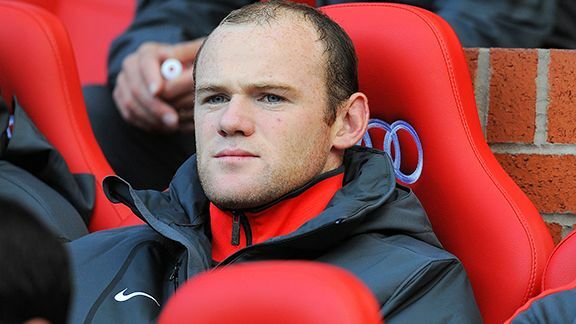 And then there's Wayne Rooney. According to reports in the English media, the star striker has had a falling out with Sir Alex Ferguson and wants to join a who's who list of stars -- David Beckham, Roy Keane and Ruud van Nistelrooy, among others -- who've left Old Trafford after their relationship with the manager soured. It's a sensational blow to the club. Even though Rooney has scored just once in the Prem, off a penalty kick no less, he's coming off a career season for United. Without him, the Red Devils will have to rely on Dimitar Berbatov and Javier Hernandez. Both have been playing well, especially Berba, but neither of them are as battle tested as Rooney in the crucible of competition that is the Theater of Dreams. And word is that French international and troublemaker Patrice Evra is also looking for the exit sign. These wouldn't be minor personnel changes, but the beginning of a seismic shift in the makeup of the team. This season, SAF already has used 24 players in the Premier League alone. This isn't because he's trying to cope with an injury crisis. It suggests a few other things, though: one, a manager who must rotate his aging players; two, a manager who can't figure out his best Starting XI; and three, a manager who knows big changes are ahead. After all, how much longer can old guard warriors Paul Scholes and Ryan Giggs be counted on? And who will replace them? If the answers are Anderson and Michael Carrick, who started on Saturday, United are headed for mediocrity and the Europa League. That's where the dominoes could start to fall. Without the financial windfall that comes from playing in the Champions League, United's financial outlook would go from bad to worse. If the Red Devils couldn't reinvest some of the $80 million they received from the sale of Cristiano Ronaldo two seasons ago, who would they be able to afford if they were bumped out of Europe's premier competition? Let's hope Bebe has a kid brother or something. It's a doomsday scenario, but at the rate both clubs are going, do you think either one will be in the top four by season's end? Going from top dog to struggling has-been is a slippery slope. Once you're on it, it's hard to stop. 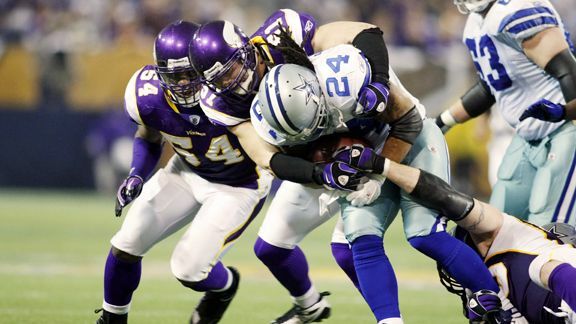 In the highly anticipated match-up of high-profile teams with 1-3 records, it was the Vikings who managed to take a step in the right direction by holding off the Cowboys, 24-21. It wasn't a particularly well-played game, and at 2-3 the Vikings still have plenty of work to do, but Minnesota did manage to come back from a halftime deficit and get just enough out of their offense, defense and special teams to pull out a close win. Vikings quarterback Brett Favre had his first game of the season without an interception, and he completed 14 of 19 passes for 118 yards and a touchdown. Randy Moss was the Vikings' leading receiver with five catches for 55 yards. Cowboys quarterback Tony Romo made bigger plays than Favre, but also made costlier mistakes. Romo completed 23 of 31 passes for 203 yards, with three touchdowns and two interceptions. Both interceptions were picked off by Vikings linebacker E.J. Henderson, and the second one set up Ryan Longwell's 38-yard field goal with four minutes to play. Romo didn't get much help from the running game: Felix Jones had 32 yards on 14 carries, while Marion Barber had 31 yards on 10 carries. The Cowboys are going to need to get better on the ground if they're going to turn their season around. They're also going to have to improve their kickoff coverage: Percy Harvin returned the opening kickoff of the second half 95 yards for a touchdown, the second straight week that the Cowboys have given up a long kickoff return. At 1-4, it's easy to list the areas where the Cowboys need to improve. This was about as close as a game gets to must-win in Week Six, and the Cowboys came up short. Cristiano Ronaldo and Gonzalo Higuain scored twice each as Real Madrid beat Malaga 4-1 to go top of the Spanish league on Saturday, while Barcelona used a second-half surge to top Valencia 2-1 and keep pace with its main rival. Ronaldo was instrumental in each Madrid goal, starting with his feed to Higuain for the opener after half an hour before he slotted Mesut Oezil's pass into the empty net in the 45th. Oezil was fouled inside the area to set up a 50th-minute penalty that Ronaldo blasted past goalkeeper Rodrigo Galatto for his league-leading sixth goal of the season. Kris Stadsgaard pulled one back for Malaga in the 55th but Ronaldo slid a pass over to Higuain 10 minutes later for the striker to fire his fourth of the season past the outstretched Galatto. Madrid's most convincing road win of the season bolstered it for its midweek Champions League match against AC Milan. Meanwhile, Andres Iniesta and Carles Puyol led Barcelona's rally as it joined Valencia with 16 points, one behind Madrid. David Villa suited up against his former club for the first time since his summer transfer, while Barcelona also counted on Xavi Hernandez after the midfielder recovered from tendinitis. While Valencia 'keeper Cesar Sanchez frustrated Villa from his first opportunity in the 20th minute, the visitors enjoyed the better first-half chances and took advantage of Barcelona's vulnerable defense for a 38th-minute opener on the counterattack at the Camp Nou Stadium. Jeremy Mathieu burst into space down the left side to find Pablo Hernandez in front of goal to push it past Valdes despite the Catalan 'keeper getting a hand to it. Valdes kept Valencia from stretching its lead with a save to Hernandez's shot from the edge of the area in the 41st, while Mathieu blocked a Lionel Messi try at the other end just before the close of the half. Iniesta started the fightback as the Barcelona midfielder swapped passes with Xavi before slotting a 47th-minute equalizer under Sanchez. "That goal brought us back to life," Iniesta said. "We changed some things in our system going into the second half so that it would work." Xavi, who was returning from injury, orchestrated the 63rd-minute winner as Puyol sharply headed his centering cross past Sanchez into goal. Barcelona would have run away with it if not for Sanchez thwarting Villa on three separate occasions, including a 1-on-1 situation in the 61st. "To win these types of games will help us," coach Pep Guardiola said. "In the first half it was impossible because we didn't have the ball." At La Rosaleda Stadium, Madrid was unlucky not to be ahead earlier as Higuain's fierce shot came off the near post in the 19th while Sami Khedira rattled a long-range try off the crossbar in the 26th. But Higuain made no mistake as he volleyed a shot back across goal under Galatto after being picked out by Ronaldo with a floated cross to the far post. Malaga nearly answered as Quincy Owusu-Abeyie and Jose Salomon Rondon had chances before Oezil capped a Madrid recovery in the midfield by finding Ronaldo alone in front of goal to steer in the second. Edu Ramos dumped Oezil to the ground to set up Ronaldo's convincing penalty, but Stadsgaard shook off Khedira to tap a flicked-on corner into goal. Higuain sealed it with a rising shot into the far corner as Madrid dominated the close, with Galatto making a number of impressive stops. Earlier, Simao Sabrosa and Diego Costa scored in each half as Atletico Madrid beat neighbor Getafe 2-0. Getafe enjoyed good pressure to start the match at Vicente Calderon Stadium but a foul on Atletico's Jose Antonio Reyes on the edge of the area set up the 37th-minute opener. Simao curled a free kick over the defensive wall and off the post, with the ball bouncing off the back of diving goalkeeper Jordi Codina into goal. Atletico struggled to create chances without strikers Sergio Aguero and Diego Forlan in the starting lineup, although Forlan went on as a second-half substitute. But it was Juan Valera's quick dart along the right side that set up Diego Costa to sidefoot into the top of the net in the 73rd to seal the derby match between the Spanish capital clubs. Atletico improved to 13 points, while Getafe stayed on 10. In other seventh-round matches on Sunday, it's: Racing Santander vs. Almeria; Deportivo La Coruna vs. Osasuna; Levante vs. Real Sociedad; Mallorca vs. Espanyol; Athletic Bilbao vs. Zaragoza; and Sporting Gijon vs. Sevilla. Hercules plays Villarreal, which has 15 points, on Monday.